Being only weeks after the attack on Pearl Harbor, Big Red went right to work training students in Owensboro, KY for the War Training Service (See our description of the CPTP). Big Red flew over 2000 hours its first two years training WWII pilots, compared to averaging only 63 hours a year since 1944 when the program ended. Since then, the airplane has been owned by at least 20 different parties. It has spent time in Kentucky, Indiana, Illinois, Missouri, New Hampshire, California, and now here in North Carolina. She is a true antique, so come on out and experience the golden age of aviation for yourself with a ride over the beautiful Outer Banks of North Carolina. Our yellow biplane is a Waco UPF-7 serial #5399 making it the 83rd UPF-7 ever built. It is a tandem 3 seat biplane with tail number “NC29902” and was built in September of 1940. Here is a picture of NC29902 and four other identical UPF-7s right off the assembly line after two days of production. It spent its first 4 years flying in Seattle, mostly at Boeing Field as a flight trainer for the Civilian Pilot Training Program (see our description of the CPTP). It flew an incredible 3063 hours by the summer of 1944 when the CPTP program was phased out. Since that time it has only averaged less than 30 hours per year. After the CPTP stopped conducting its training, the airplane spent a little more than a year in Anchorage, AK owned by an experimental aircraft designer, builder and author. Then, in December of 1945 it returned to the state of Washington and became a crop duster for the next 6 years. In 1968 it moved again to Oregon where it remained until August of 2010 when Barrier Island Aviation bought and flew it to the Outer Banks. Now you have the opportunity to experience a real piece of American aviation history for yourself by going up for a ride in this open cockpit Biplane. In the late 1930’s prior to the United States involvement in WWII, President Franklin D. Roosevelt recognized that compared to some European countries, the U.S. had a lack of trained airplane pilots and instructors. In an effort to provide the country with an adequate pool of potential military pilots for the increasing threat looming in Europe, Roosevelt unveiled what would become the Civilian Pilot Training Program (CPTP) on December 27, 1938. The Plan provided funding to participating Colleges, Universities and Flight schools, for a 72 hour ground school course, followed by 35-50 hours of flight training to 20,000 students a year. Just as the name indicates, the CPTP was a civilian program funded by the government as an integral part of our national defense. It increased the United States ability to fight an air war by training a large number of civilians to be aircraft pilots able to transition quickly into the military. The real value of the program was realized and ramped up after the Nazi invasion of Poland in September of 1939. The federal Civil Aeronautics Authority required any CPTP participating flight school to own at least one aircraft for every ten students enrolled. 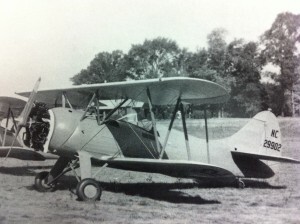 Seeing that the country had as much of an aircraft shortage as there was a pilot shortage the Waco Aircraft Company devoted more than 80% of its production to the UPF-7 a tandem seat biplane trainer for the CPTP efforts. By September of 1940, (which was when our yellow biplane rolled off their line) Waco was completing 3 planes a day, 7 days a week. Our red biplane was manufactured in January of 1942 about a month after the attack on Pearl Harbor. Once the United States joined the war following Pearl Harbor, the CPTP program became the War Training Service (WTS). Participating students still attended college courses and took private flight training, but were required to sign agreements to enter military service after graduation. 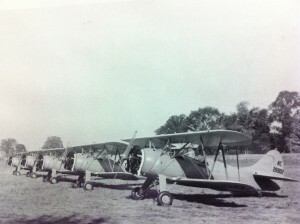 Both of our biplanes spent their first few years exclusively conducting flight training for the CPTP/WTS. By the time the CPTP/WTS was phased out in the summer of 1944, more than 435,000 people, including thousands of women and African-Americans, had been taught to fly. Notable legends trained under the CPTP include: Astronaut/Senator John Glenn, top Navy ace Alexander Vraciu, WWII triple ace Bud Anderson, Douglas test pilot Robert Rahn, top WWII ace Major Richard Bong, former Senator George McGovern, WASP Dora Dougherty, and Tuskegee airman Major Robert W. Deiz. 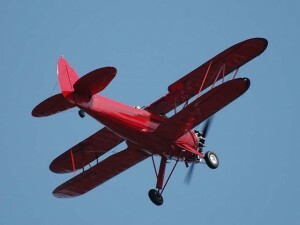 My husband and his 10-year-old daughter went on their second open-cockpit biplane just this past June, 2014. They did the same trip last year, and he and I went a couple years or so before that. All three trips were everything we had hoped. You fly out over the ocean, to see ship wrecks, and around the area, and the whole time the pilot (I'm sorry, I can't remember his name) kind of gives a tour and narrates what you're seeing. I believe he actually owns the two biplanes used for these particular tours himself. My husband is an antique aviation buff, especially WWII warbirds, and loves to talk with the pilot about the aircraft and its history. The place itself, at the Dare County Airport, is casual and laid back( the pilot brings his dog to work with him and she just kind of hangs around with you if you're waiting for someone on a flight, like I was), and everybody is very friendly. The whole experience of open cockpit flight is well worth it, and combining that with flying over the Outer Banks, which is my absolute favorite place on earth, is, as stated above, AWESOME!! !